The best detective duo is back in the third installment of the King & Kayla series by Dori Hillestad Butler! In King & Kayla and the Case of the Mysterious Mouse, King and Kayla are playing fetch with their friends, Jillian and Thor. But when Jillian throws King’s favorite ball over the fence and brings it back, King can smell that it’s not his ball. It’s up to King and Kayla to find the missing ball, but can King help his human figure out where it went—and who has it? 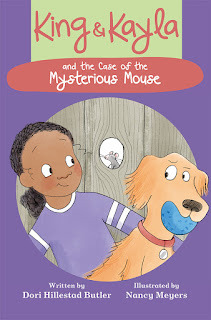 Filled with deadpan humor perfect for dog-lovers, this fun mystery series is a great way for transitional readers to practice their sleuthing skills by gathering facts and thinking analytically. The simple, straightforward language and repetition within and between the books in the series helps boost confidence in readers who are beginning to transition into longer chapter books. Looking for ways to continue the fun with Kayla and King? Check out our fun activity sheets! To learn more about the creation of the King & Kayla series, read our Q&A with editor Kathy Landwehr here! Can King and Kayla solve the latest mystery this September? Find out at your local library, indie bookstore, or Barnes & Noble—we guarantee it’ll still be your favorite thing!